Spring is all about new beginnings and we are embracing that symbolism as we get ready for Green Season by completely revamping several of our adventures, including fly fishing. You can still meander outside your cabin to the banks of the Buffalo Fork River and cast away, but we’ve got so much more for anglers this year. Overnight trips in the Teton Wilderness and horseback rides to secluded fishing holes are just a few of the new options to consider when you’re booking your summer visit. Plus, our guided fishing offerings are all-inclusive. Your fishing gear, including quality Orvis equipment, waders, and flies, snacks and beverages are included in our Walk & Wade packages. A pre-trip, one-hour casting lesson is also available for an additional cost for newcomers to the sport and those who want to knock off the rust and get a few expert pointers. We’ve also expanded the fisheries you’ll visit beyond the Buffalo Fork River to include Pacific Creek, Spread Creek and Blackrock Creek, areas that were recently were named as Top 10 fly-fishing destinations in Wyoming. The full and half-day, Walk and Wade options are what we consider classic fishing at the ranch. These packages are designed for two anglers with the option to add a third. This small group private setting ensures our experienced guide can give each guest the personalized service that is our trademark. Each trip is different because our guides will determine the fishing spot based on that day’s conditions. It doesn’t get more western than strapping your fishing gear onto your saddle and heading out for a day of fishing on the Buffalo Fork or Snake Rivers. You’ll cast into blue-ribbon waters teeming with native cutthroat trout. Then, take a break from fishing to enjoy lunch along the shore trading secrets and stories with your companions. Follow our guide into the iconic park where you’ll explore the rivers and creeks where the alkaline levels are higher due to the geothermal activity. 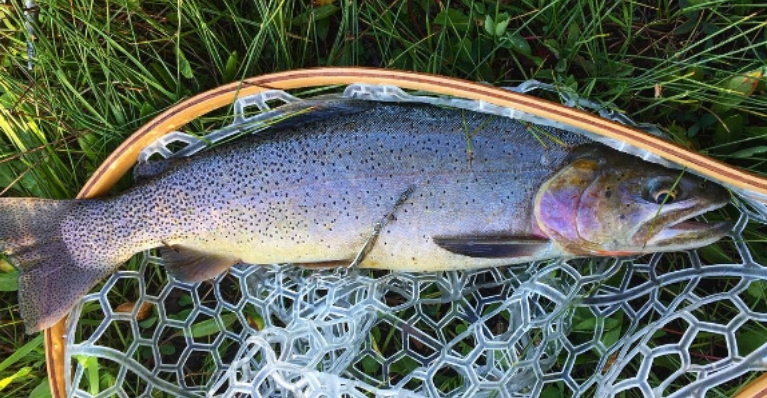 These conditions nurture a healthy habitat for seven species of game fish, including brown and rainbow trout, as well as mountain whitefish and grayling. We are especially excited to be offering new overnight fishing trips into the Teton Wilderness. You’ll be chaperoned by our guides and wranglers as you traverse the land by horseback to isolated fishing spots where camp will be set up. Each day during your two- to five-day trip, you will ride your sure-footed steed through rugged scenery to the banks of a wild river where you will trade your cowboy boots for waders. After a full day of adventure, come back to camp where your authentic mountain man of a guide will prepare a full meal over a fire. As the sun sets and stars come out, rest your head on a pillow in a well-appointed spring-bar tent. Repeat as many times as necessary to relax, restore and put your senses back in order. Think of this as the ultimate all-inclusive fishing package. Your room, activities, meals and other amenities are included. The ranch will serve as home base where each day you’ll venture out to that day’s best location for fishing. It might Pacific Creek, Blackrock Creek or one of the multiple locations inside Yellowstone. You’ll return each day to your cabin or chalet, get cleaned up and enjoy a three-course Chef’s dinner in the lodge.